Welcome to the Updated Tigerpaw Community! This resource is available to all Tigerpaw Software customers and is designed to connect you by providing a space to ask questions, share files and stay up to date on Tigerpaw. 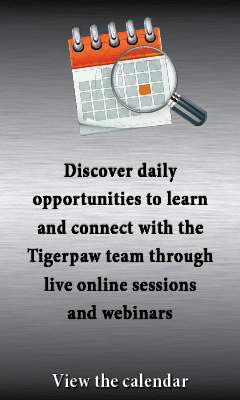 We encourage you to explore the new functionality, update your profile, connect with others and start sharing your Tigerpaw questions and successes! Welcome to our newest member, Selene Diaz. Check out this post from our Director of Development to learn about the v18 update, Tigerpaw product development, and how we can improve transparency and communication. Drop into the thread and say hi to our newest Tiger! HUGE NEWS! The brand new, modern, updated, clean, and all-around awesome Tigerpaw UI redesign is coming soon! What?! This is incredible! Show me a post about this!